BOSTON, January 12, 2016 – Single-family home sales grew 16.4 percent in November by posting 2,210 sales, continuing a very strong year for Connecticut’s residential real estate market, according The Warren Group, publisher of the Commercial Record. While overall sales grew from the November 2014 mark of 1899, median sales prices decreased 8.4 percent, slipping from $250,000 last November to $229,000 in November 2015. Median prices have fallen or remained flat 23 out of the last 25 months, starting with November 2014. March 2015 (3.1 percent) and February 2014 (4.9 percent) was the only two months of year-over-year median price increases. November’s sales continued the hot market; year to date, there have been 26,846 single-family home sales, a 14.4 percent increase from the 23,464 through the first 11 months of 2014. Cities like East Hartford (45 sales, 150 percent year-over-year growth), Waterbury (64 sales, 113 percent growth), and West Haven (35 sales, 94.4 percent growth) had particularly robust markets in November for single-family homes. 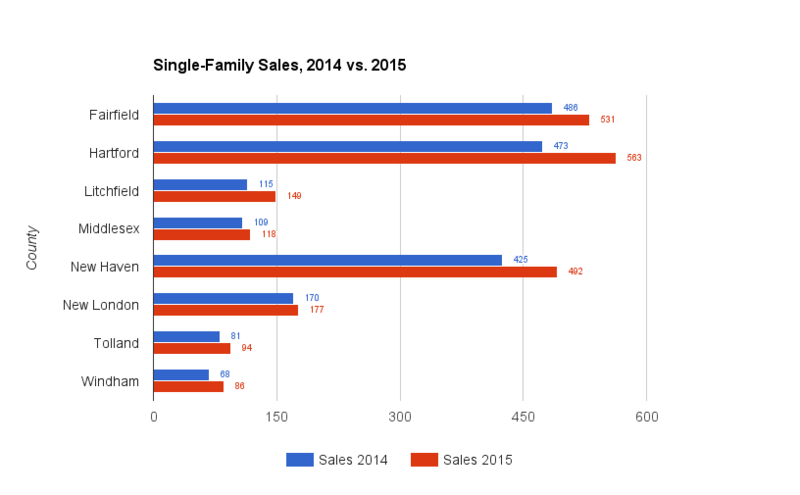 On a county level, smaller counties show the most growth in single-family home sales. Litchfield and Windham counties had the biggest gains in November, with big Hartford county notching third place. For the year to date New Haven, Litchfield, and New London make up the top three. There were 578 condos sold in Connecticut in November 2015, an 8.2 percent rise from November 2014, which had 534 condo sales. The median price for a condo was $158,000, a 6.0 percent decrease from the median in November 2014 of $168,000. Through November there were 7,165 condo sales in Connecticut, a 12.7 percent increase from the 6,358. The median price for a condo through November was $160,000, a 2.9 percent decrease from the median of $170,000 through the first 11 months of 2014. Click these links for more detailed town-by-town and county-by-county statistics.